Welcome to Nelson's Dry Cleaning and Formal Wear, where you are provided the highest quality products and services! We are the only dry cleaner that never sleeps! For your convenience, we are open 24 hours a day for drop off and pick up. We also offer same day service. To learn more, visit our dry cleaning page or contact us. We are now booking wedding packages and we have some exciting discounts to offer you. 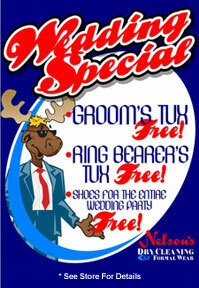 Not only are we offering the groom and ring bearer tuxes for free, we will provide shoes for the entire wedding party at no cost to you! Are you attending a wedding in the near future that has already been booked with us? Click here to register for your tuxedo on our easy to use tuxedo registry page. All of us here at Nelson's strive to give you the best experience possible. If you have any questions at all that are not answered in the pages of this website, please feel free to contact us using the information in the upper left corner. From us to you... Welcome! We look forward to serving you now and in the future.